Perfect for all skin types. All-in-One Makeup Remover: non-rinse cleanser, non-rub makeup remover, nourishes skin without oily residue. Removes makeup easily and instantly, while eliminating impurities and pollution. It is soothing and suitable even for the most sensitive skin -- leaving skin soft, clean, and comfortable. The micellar formulas are light and gentle. There is no need to rinse them off so moisturizing ingredients can stay behind to be absorbed, making it the best solution for sensitive and acne-prone skin. What's good about it is that it does it's job in removing makeup. At first I liked the smell pero nung nagtagal I came to think that the fragrance might cause a negative effect in face at may lasa siya sa lips kung titikman mo but not that stingy. And for a combination skin type like mine, tinry ko siya as oil cleanser, noticable ung small bumps sa noise ko pagkatapos gamitin. BTW this the first micellar water that I tried so if I'm gonna buy next time, I'll prefer ung gentle lang, baka dun ako hiyang. For know I can use this for lips and eyes. 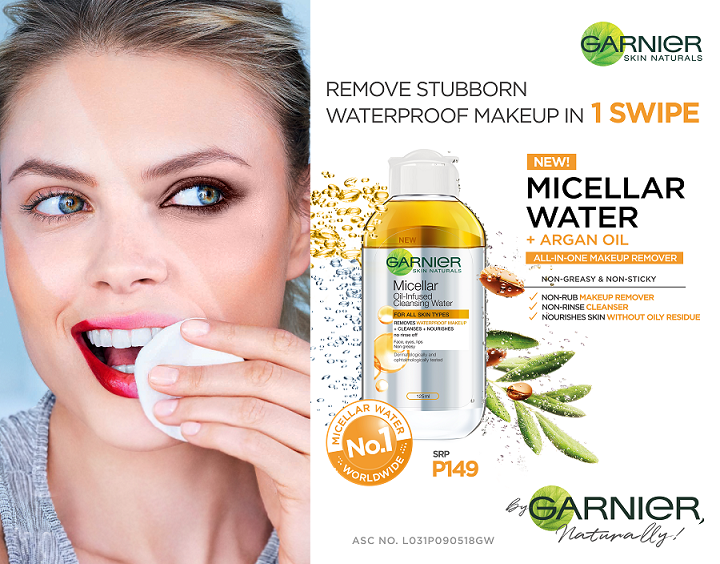 Super ganda ng Garnier Micellar Water with Argan Oil. Super smooth sa face non-greasy kahit na hindi banlawan. 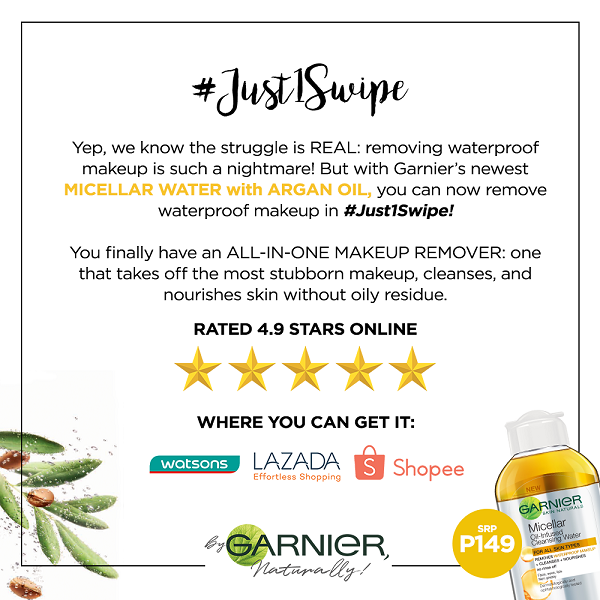 "Tackle hard-to-budge makeup and the like, with this clever formula that doesn’t require water to rinse off especially with waterproof make up. Genius." I’ve been using it consistently for about a week now and I can say that it’s become one of my favourite micellar water ever. It can easily take off even my favourite waterproof eyeliner as well as the rest of my makeup without leaving an oily residue that I’ve come to associate with most micellar water. It makes my skin look and feel so clean and refreshed, almost as if my face was just freshly washed. It’s something that I can see myself reaching for more on a day to day quick makeup cleanup.